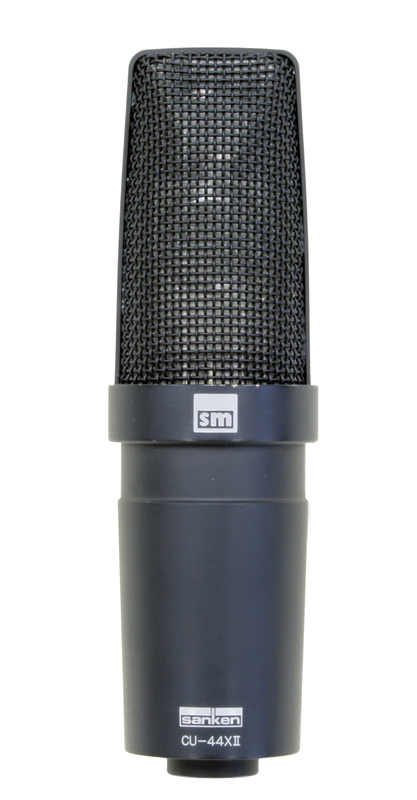 In 1982, Sanken introduced the first of the company’s dual capsule microphones, the CU-41, a cardioid condenser microphone which established a new standard for music and voiceover recording. The CU-41’s 2-way capsule provided flat frequency response and distortion-free performance from 20Hz to 20kHz, resulting in a completely natural and uncolored sound. The CU-44X introduced in 1988 was an output-transformerless version of the popular CU-41. The high speed transient characteristics of a transformerless design afforded new degrees of accurate spatial reproduction and colorless sonic transparency. While the CU-44X required a special PSU power supply, the new CU-44X MkII conveniently houses the 48V phantom power supply within the body of the microphone. The CU-44X MkII’s frequency response is totally flat , not only on axis, but also at 90 degrees, and even at 135 degrees. This capacity is essential in maintaining absolute sonic transparency. The smooth cardioid polar pattern and uniform response over the entire frequency range allows the CU-44X MkII to capture both the designated audio target as well as the naturally reflected sounds, with identical optimum response. The CU-44X MkII has the desirable characteristics of a transformerless design, achieving superior transient response and vivid sonic imagery. This revolutionary new microphone has a maximum input level of 140dB (1% THD), making it capable of withstanding extremely high sound pressure levels without distortion. The CU-44X MkII was certified by METAlliance.